We stayed with friends who live in Ormond by the Sea, FL last July and it was a blast. Ormond by the Sea is an unincorporated town in Volusia County, FL. It’s north of Daytona Beach right along Florida’s Atlantic Coast. Our friends have the Halifax River on one side and the beach on the other. The Halifax River Blueway is a 17 mile long paddling trail on the Intracoastal Waterway (source). Their house is just a few blocks from the beach. LOVE THAT! We didn’t get a chance to spend time on the river so that is on our list for next time. 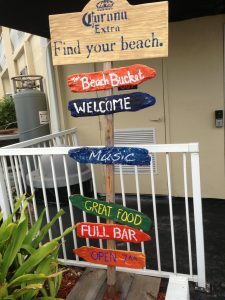 We ate at some yummy restaurants in Ormond Beach like the Beach Bucket, an oceanfront bar & grille, Peach Valley Cafe and Caribbean Jack’s (Daytona) and Racing’s North Turn (Daytona Beach). Loved them all. But I especially like restaurants with outdoor seating and on the beach/water. The beach we went to in Ormond by the Sea was awesome. There were hardly any people on the beach and it was so relaxing. Next time we go, my plan is to spend more time on the beach and in the water. Our friends are always prepared for the beach with coolers, chairs, umbrellas, cocktails and more. Everything you need for a fun, relaxing day at the beach. Like I said, in Ormond by the Sea, you aren’t far from Daytona Beach where a lot of the action is or from Flagler Beach which we drove through to get to St. Augustine. Flagler Beach was a busy little town. 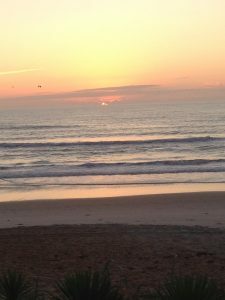 You can read more about Ormond Beach though on Visit Florida. If you tweet, share the Florida love with the #LoveFL hashtag. We are already discussing taking another vacation there next year in 2015. There is still so much we weren’t able to do. But we’ll definitely take in another NASCAR race and I really want to go back to St. Augustine. I also have a couples massage on the wish list at Angelic Gardens, http://dayspawellness.com/ that I hear is a great place. We sure miss our friends and can’t wait to get back to visit! Have you ever been to Ormond by the Sea, FL? 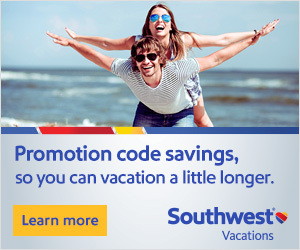 We’re heading to Florida this summer and this sounds like another great place to stop!